Recently, TechnoKids launched a new website. Our goal was to make it easier for teachers to find the technology projects suitable for their students. One exciting new feature added to the website was an advanced search tool. It allows visitors to filter projects by level, grade, subject, technology skill, and program. Another new feature added to the website was a SAMPLES tab. It contains PDFs of excerpts from a project. This allows visitors the ability to preview assignments, sample work, and assessment tools in a window. To view each PDF file, the visitor clicks on a thumbnail. 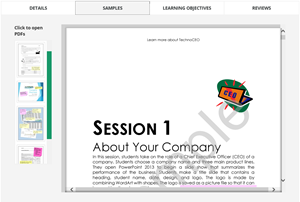 TechnoKids technology projects can be seen by clicking on a PDF thumbnail. The PDF thumbnails were made using A-PDF Thumbnailer. When TechnoKids was preparing to launch our site we had to create 120 thumbnails. A-PDF Thumbnailer made the task so easy. All the PDF files were placed into a folder. We then set the width/height, border, and shadow effect. Instantly, a thumbnail for each PDF file was created. With the click of a button we had a batch of thumbnails! The thumbnail file was the identical name as the PDF file. This made it easy to connect a link from the PDF file to the thumbnail image. One feature we quickly came to like about A-PDF Thumbnailer was the ability to customize the page used as the thumbnail. Originally, we set Page 1 for the batch conversion. However, after reviewing the thumbnails a few of the PDFs were bland looking. In those cases, we selected a different page to show as the thumbnail. This helped to make each thumbnail colourful and interesting. After reviewing many products, TechnoKids found that A-PDF Thumbnailer was the perfect solution to making thumbnails of PDF files. We appreciated being able to download a trial version. If you are looking to create thumbnails for a large number of PDF files or you want control over how your thumbnail appears, this software is the perfect PDF Thumbnail Maker solution.